Everyone needs a place to call Home! 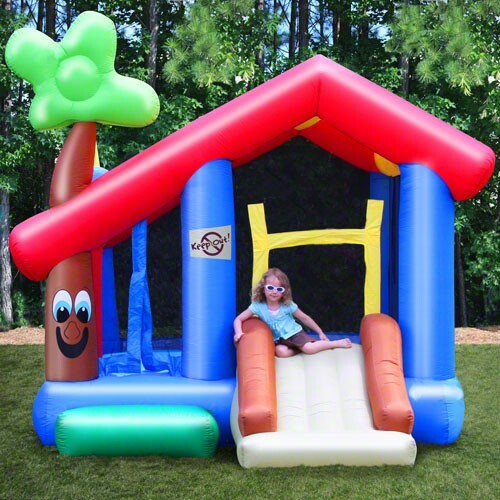 The My Little Playhouse Bounce House is a great bouncer with lots of room to play and bounce. The bounce house floor has a jump space that is approximately 9' x 9'. Smart Shade panels are designed in the roof so you can position the bouncer panels facing the sun to block the UV rays. The Bounce house slide is approximately 5 feet long. The entrance has an inflated step in case little ones should fall. Overall dimensions are 10.5' x 13' x 9.5'. Recommended for up to 4 kids at 100lbs each.